In September, 1928 — Alexander Fleming Invented The World's First Antibiotic, Saving Over 200 Million Lives. This Is Bigger. "The Molecule Of The Century"
You’re looking at the future of modern medicine. It’s 1/1000th the width of a strand of human hair. You can’t see it with the naked eye. Among its many superpowers? It can amplify the performance of medicinal marijuana by up to 80 times — making it vastly safer, cheaper, and more effective. Medicinal pot giant GW Pharma achieved a $4.22 billion valuation with a drug for childhood epilepsy that will only ever help 40-50,000 Americans. Chronic Pain... an $83 billion market. Heart Disease... a $93 billion market. Even Cancer... which is a $121 billion market. And, this breakthrough isn’t buried in some lab on a college campus. “The Molecule of the Century” already has FDA approval. The company that owns it could have multiple “MoC” therapies in Phase 2 clinical trials this year. Unlike most “me-too” medical pot stocks — it's actually done it before. The CEO has taken a drug through Phase 3 clinical trials — raising $300 million in venture capital, and creating $1 billion in investor value. If any of its new drugs show promise — we could be looking at a $10 billion stock. If all of them hit — we’re looking at the next Bayer, Pfizer, or Merck. Which makes this stock a stunning bargain for anyone in the know. Ever since Constellation Brands plowed $4.5 billion into Canopy Growth — valuations in the legal cannabis space have been sky high. You might even think you’ve missed the boat. I’m telling you right now — the biggest gains are still to come. We’ve got Fortune 500 companies like Diageo, Altria, and even Coca-Cola sniffing around the marijuana ecosystem for deals. I anticipate many of them could dwarf the Constellation story. It’s the perfect time for this tiny stock to emerge as the next pot Pharma Titan. Up until very recently, this company was privately held. Unless you were an accredited investor with stellar connections, you couldn’t buy the stock at any price. It’s not being covered on CNBC or in the Wall Street Journal... yet. Even now it's so deep “under the radar”, very few investors know it exists. But this opportunity won’t stay open too long. It’s only a matter of time before analysts pick up this story. Eventually, ordinary investors will catch on. When they do, this stock is going to move. If you’re not in early, I guarantee you won’t get in at all. And since time is of the essence — I’m going to cut to the chase. Why — in spite of the enormous potential for cannabinoid drugs — the science behind medical marijuana is fatally flawed. How publicly traded pot companies are lying to investors about the problem. A new, patent-protected “Molecule of the Century” — already approved by the FDA — that could make cannabinoids like CBD up to 80x more effective. The facts behind the first new therapy for diastolic heart failure in over 20 years. How this tiny company could cure 90% of the world’s most fatal brain cancer... not to mention one in two patients for all known types of cancer. 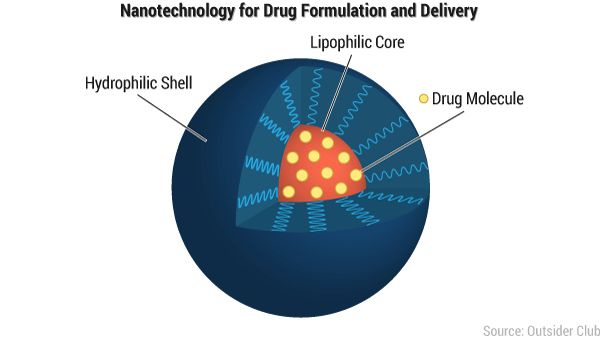 And, why this breakthrough nanotechnology is poised to make an entire generation of drugs 10-100x safer, cheaper, and more effective. PLUS: How you can earn up to 11,678% returns on the “Molecule of the Century” before the market clues in to its Earth-shattering potential. And, if anyone is qualified to make that call — it’s me. My name is Jimmy Mengel. I’m the editor of The Marijuana Manifesto. And, I’ve been at the forefront of this explosive industry for more than four years — long before the mainstream talking heads started taking it seriously. In other words, you’ll have a hard time finding another pot insider with such a full rolodex of industry leaders, CEOs, and experts. 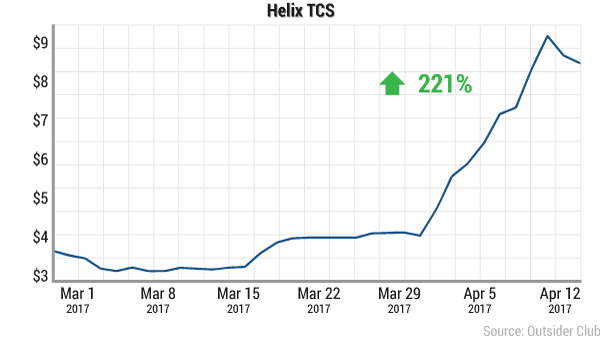 When I recommended Helix TCS in 2017, it popped 221% in 31 days. 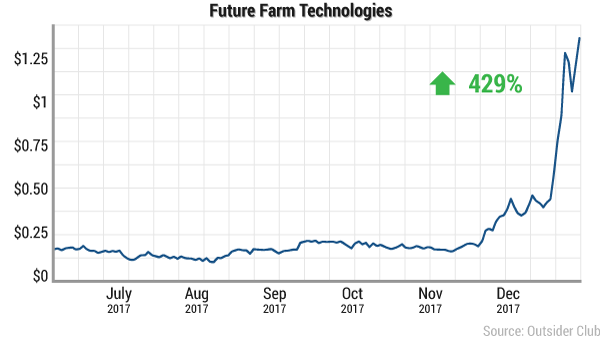 My Future Farm Technologies recommendation returned 429%. 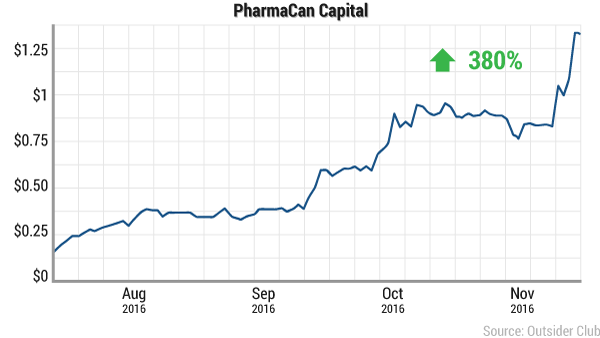 I recommended PharmaCan Capital, a cannabis investment company, in August 2016 — betting it would spike through the Presidential election. I was right. In three months, the stock jumped 380%. You could’ve collected $38,000 cash from every $10,000. And, then there’s my most well-known cannabis call. 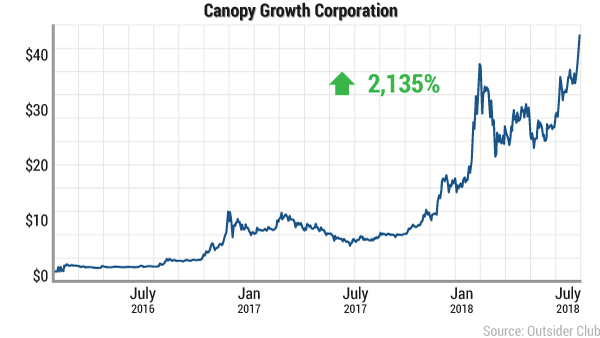 After becoming the first newsletter writer to tour Canopy Growth Corporation’s facilities — I told my readers to get in at $1.86 per share. Today, it trades over $41 for an amazing 2,135% gain. That would turn every $10,000 into $220,400. The special situation I’m sharing today is bigger. Much, much, bigger. Today it’s valued at a market cap of just $84.9 million. We should still be looking at a $10 billion company. Every $10,000 you invest could return over $1.16 million. Normally — an opportunity like this is for insiders only. Fortunately for you — we’ve got all the juicy details. Several months ago I received a tip off from my partner Nick Hodge. For those who don’t know, Nick is the founder of Outsider Club. He’s helped raise tens of millions for pre-IPO stocks. The last time he raised money for a private cannabis stock was Green Organic Dutchman Holdings. He got his readers in at $1.65 per share. Within a month of the IPO it had traded all the way up to $8.28 for a 402% profit. In mid-2017, Nick helped the owners of the “Molecule of the Century” raise $1 million. After it went public, he persuaded me to take a call with the CEO. What I heard in that conversation shook me to my core. Everything you think you know about legal cannabis is wrong. The biggest names in medical marijuana are fatally flawed. And, the best opportunity in the space is a tiny Canadian biotech stock you’ve never heard of. The plant contains 113 cannabinoid compounds. They are amongst the most important medical molecules ever discovered. It’s one of the most potent natural inflammation fighters ever discovered. It’s been shown to be safe and effective in over 80 independent clinical trials. Scientists are already developing CBD therapies for alzheimer’s, arthritis, diabetes, chronic pain, heart disease, epilepsy, autoimmune disease, and even cancer. That enormous potential is why the global medical marijuana market is projected to reach a value of USD $55.8 billion by 2025, according to Grand View Research. It’s also why companies like GW Pharma, INSYS, Zynerba, and others have achieved market valuations ranging from $300 million to over $3 billion. And it’s opening the door for this tiny company to steal the entire market. This is the ugly reality pot investors need to know immediately. Drugs are only effective if they get into your bloodstream. Unfortunately for CBD — and a whole class of other “lipophilic” molecules — that’s a tall order. You see — lipophilic molecules are fat soluble. They don’t mix well with your blood — which is water-based. Your body views these particles as foreign invaders. They’re attacked and repulsed by your liver and immune system. When you consume CBD — or any other lipophilic drug — only a tiny fraction fights its way through your biological defenses to become therapeutically effective. In scientific terms — these molecules have poor bioavailability. Even if they could cure heart disease or cancer… they can’t get to the site of disease. In pill form — less than 10% of the CBD you consume makes it into your blood. Worse yet — even after it arrives, it doesn’t stick. Your body quickly “flushes” most of it out. Within just six hours… 90% of the drug is gone. To reach effective levels of CBD in the bloodstream, patients are forced to take enormous doses. This is expensive, inefficient, and it can cause undesirable side effects. In a recent GW Pharma study — effective dosage for an 80kg person suffering from Lennox-Gastaut syndrome was 1.58 grams of CBD per day. That course of treatment might cost $35,500 per year. For insurance companies, the cost threshold for a new heart disease treatment is just $5,000. Existing CBD therapies might be seven to eight times too expensive. If you’ve ever wondered why it's targeting a tiny “orphan indication” that only affects 70,000 people worldwide — now you’ve got your answer. And, you’re likely starting to understand our once-in-a-lifetime opportunity. How the “Molecule Of The Century” Can Save Medical Marijuana... And Put A 11,678% Windfall In Your Pocket! The stock I’m telling you about isn’t just a medical pot company. 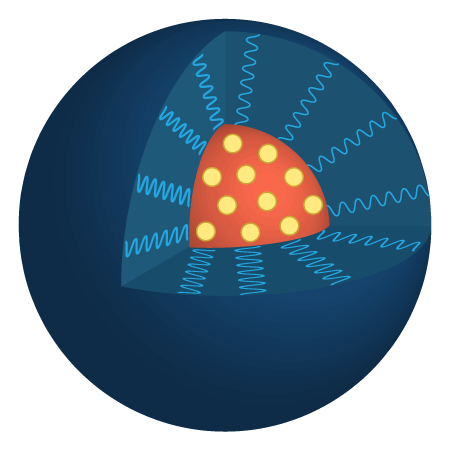 It's a nanotechnology powerhouse, with cutting-edge drug delivery platforms. 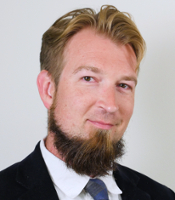 Its breakthrough “molecule of the century” was developed with the University of Alberta over the past eight years at a cost of more than $3.5 million in R&D expenditures. The scientists who invented it are part of an in-house team of world-leading cardiologists, immunologists, oncologists, and recognized authorities on drug delivery. One is an honored member of the Order of Canada. If you can’t figure out how to get a powerful molecule to where it’s needed in the body, these are the exact men and women you’d reach out to. And, the solution they’ve deployed is absolutely stunning. You’re looking at one of the most pivotal nanotechnology breakthroughs in history. This novel molecule gives “stealth” properties to fat-soluble drugs like CBD. The inner shell is fat soluble. It acts as a cage to hold the drug. The outer shell is water soluble. It tricks your body into opening up access. Instead of rejecting the medicine as a “foreign invader” — your liver waves it on through… no questions asked! And, before you ask — yes it’s 100% patent protected. With ordinary CBD, only 10% of the drug gets past your liver. Protected by the molecule of the century — nearly all of it sneaks through the firewall into your blood. Once it’s inside — it sticks around much more effectively. Currently, 90% of pure CBD is “flushed” out of the body within five hours. With their innovation, you could have effective levels of the drug for up to a week. So instead of taking a pill four times a day, it could be 52 times per year. Better yet — the molecule of the century is incredibly targeted. Most therapies aren’t selective in terms of drug delivery. They “carpet bomb” your entire body with powerful pharmaceutical compounds. Recent experiments on the molecule of the century show it’s attracted to sites of inflammation. It concentrates CBD in the spots where you need it most. All told — we’re talking about a bioavailability improvement of up to 80x. It could take a $100,000 therapy, and bring the cost down to a few grand. Low enough for insurance companies to cover, which is huge. Obviously, that’s a MAJOR leap forward in the science of medical marijuana. But..
With this technology in hand, the company isn’t forced to go after “orphan indications” like epilepsy with tiny commercial upside. It can go after BIG game. Think about it: According to Arcview Market Research — spending on legal, recreational cannabis worldwide is expected to hit $57 billion by 2027. The pharmaceutical industry is worth $341 billion today. And, that’s just in North America. Globally it’s worth over $1.1 trillion. Pain management alone is an $83 billion market. Heart disease costs $93 billion every year in the U.S.
Cancer is a $121 billion industry unto itself. If you can solve CBD’s bioavailability problem — it’s going to revolutionize treatment for millions of people around the world AND create billions in investor value. It could very well be the next Bayer, Pfizer, or Merck. And, it's got multiple — highly credible — pathways to get there. Unlike most biotech opportunities, this is not a “one shot” opportunity. The company is pursuing multiple near- and long-term monetization channels. The first and fastest route will allow it to get into cash flow in the first half of 2019 — without ANY FDA approval process whatsoever. It gives the company exclusive first-mover advantage in a market poised to grow 700%, all the way to $2.1 billion in annual sales by 2020. The second opportunity gives it a chance to become the first new FDA-approved treatment in the $15.35 billion diastolic heart failure market. That’s a disease category at least 10x the size of anything its competitors are capable of targeting. This unknown stock could soon own it outright. The third opportunity is the one that could literally change the world. It’s a therapy that combines the “molecule of the century” with a kind of anticancer “heat-seeking missile.” It could cure 90% of the most fatal brain cancer. 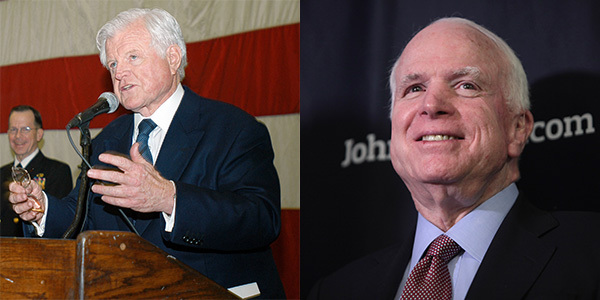 The disease that killed both Ted Kennedy and John McCain. More importantly — it might cure one in every two patients for all known cancers. Last year, the company announced a partnership with Dalton Pharma — a cGMP-certified provider of drug development and manufacturing services. Under the terms of the deal, Dalton will produce 99.5% pure synthetic CBD with next to zero THC content — at the lowest prices in the industry. Under Bill C-45 — the Cannabis Act — any CBD product sold to consumers must be free from psychoactive cannabinoids or carry restrictive labeling. Right now, no other company can achieve these levels of purity. It may literally be impossible to do it with plant-sourced cannabidiol. Now the company has the potential to be the first and only Health Canada-authorized, manufacturer who can offer a CBD oil without this label. It literally will be the world's purest CBD. Right now, CBD oils are sold in both Canada and the United States in a kind of legal grey zone. They’re sold for everything from anxiety to joint pain. It could be a $500 million market in Canada alone within a few years. By 2020, it’s projected to grow 700% globally to $2.1 billion. As the regulatory fog clears — this tiny stock could own a huge slice of that action. While its pharmaceutical formulations work through the FDA approval process, a CBD nutraceutical can be sold almost immediately. Its first product will hit stores as early as Q2 2019. The branding and go-to market effort is being led by an ex-VP from Diageo — the world's largest producer of spirits. Unlike most early-stage biotech stocks, it could be in cash flow this year. Even with 10% of a $2.1 billion market — its revenue would be four times its current market cap. That represents a valuation floor for the stock, post-IPO. That revenue would also fuel its big-picture pharmaceutical efforts. This is where we see true “blue sky” mass-market potential. Heart failure is the single worst killer of Americans. Roughly 5.7 million adults suffered from it in the United States alone, as of 2016. It’s practically a death sentence. Half of the victims will die within five years of their diagnosis. It kills 610,000 Americans every single year. That’s one in every four deaths. The cost to the U.S. economy is a staggering $30.7 billion per year. Globally, this is a $93 billion problem. Innovation on new treatments has been tragically slow. There hasn’t been an effective, new therapy for diastolic heart failure in over 20 years. That’s where CBD and the “molecule of the century” come in. The root cause of heart failure is inflammation in the tissues of the heart. The muscles swell up, stiffen, and fail to pump enough oxygen-rich blood to support your body. If you can reverse the inflammation, you can heal the heart. That’s what the science shows CBD can do. It flushes out inflammation in diabetic cardiomyopathy. It prevents tissues from stiffening up in autoimmune myocarditis. It dramatically reduces cardiac ischemia. If you’re not a doctor — that’s a bit of a mouthful. The bottom line is this: CBD can reverse all the major signs and symptoms of heart disease. There’s just one major problem for MOST medical marijuana stocks. Current attempts to treat heart failure with cannabidiol have required unrealistically high doses of the drug. With the “molecule of the century” — that’s not necessary. In testing, the company has found it increases CBD bioavailability by up to 80x. It disguises itself as water… sneaking right past your body’s defenses. Not only that — it literally targets the drug to sites of inflammation. With this technology, the company can develop economical CBD therapies for the $30.7 billion diastolic heart failure market for the first time in history. Its CBD therapy is expected to enter Phase 1 clinical trials later this year, with a plan to enter Phase 2 in the second quarter of 2019. 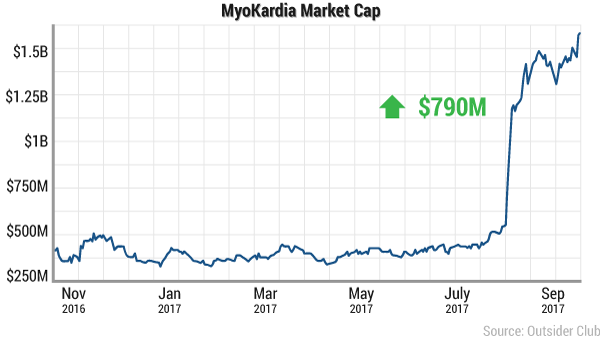 Last year — MyoKardia (MYOK) announced positive Phase 2 results on a therapy for one of the tiniest orphan indications in heart disease. It added $790 million to its market cap overnight — popping over $1 billion. But, the heart disease category it's targeting is over 10x larger! With FDA approval — its heart therapy could absolutely drive a $10 billion market cap. Given where it's trading now — you could earn up to 11,678%. We’re going to get in BEFORE 99.9% of investors hear about the stock. And get this — heart disease isn’t the only mega-market it's after. Cancer is the modern plague. Glioblastoma is one of the worst forms of it. A diagnosis with this brain cancer practically guarantees you’ll be dead within five years. It’s what killed Ted Kennedy and John McCain. Average life expectancy is less than one year. The cost of six months of the current standard therapy is $140,000. Some treatments, like CAR-T, cost as much as $475,000 for a single treatment. It “might” extend your life a few months… but it won’t save you. Thanks to a brand-new natural killer cell therapy that targets a protein called HsP70 — that’s about to change. You won’t find HsP70 on healthy cells — but it shows up like a kind of “homing beacon” on the outer wall of tumor cells for some 90% of glioblastoma patients. If you target HsP70 — you can trigger an immune response to kill the cancer. In preclinical studies, it indefinitely extended the life of 50% of tumor-bearing animals. Scientists gave it to mice with a terminal diagnosis. They weren’t supposed to last more than a handful of weeks, at most. No other therapy had ever produced survivors beyond 30 days. With all other treatments, the survival rate goes to zero. But with this company's treatment over half the mice went on to live normal lives. It's the first time a company has ever produced a drug that allowed that many mice to survive brain cancer. When you combine the killer cell with CBD and its nanotech delivery system — the results are even better. And get this — it goes well beyond glioblastoma. You see — HsP70 isn’t just found on the outer walls of one rare type of cancer. You can find it in 40-60% of patients suffering from a wide range of different cancers. It’s in 50-75% of non-small-cell lung cancer patients. 45-60% of all breast cancer patients. For colorectal cancer, it’s 40-55%. And for pancreatic cancer, it’s 50-70%. The list of potential applications goes on, and on. At the end of the day, this combination therapy could help cure one in every two cancer victims. We’re talking about a market worth some $121 billion every year. And, it isn’t some blue-sky, far-off technology. Glioblastoma is an orphan indication — which means it can be fast tracked through clinical trials. A normal drug might take seven years to get FDA approval. This could be in Phase 2 in the United States this year — on pace to get full approval within three years. After that — they’ll start targeting every other HsP70 cancer. How Much Might a Cancer “Silver Bullet” Be Worth? An estimated 1,735,350 new cases of cancer are diagnosed in the U.S. every year. A whopping 14.4 million have had the disease at some point in their life. In January 2018, the $71 billion biopharmaceutical giant Celgene spent $7 billion to buy another drugmaker called Impact Biomedicines. Celgene wanted the company’s early-stage experimental blood cancer drug. It was being developed to treat a rare type of cancer affecting just 18,000 people in the United States called myelofibrosis. In short, Celgene splurged $7 billion to buy a drug that helps just 18,000 people. These guys are targeting a market that’s potentially 401 times bigger. That’s why I believe this stock will absolutely rocket over the next few months — with the potential for 11,678% gains as its therapies receive FDA approval. Right now NOBODY knows about this under-the-radar company. It just quietly IPO’d, and analysts are only now picking up coverage. That’s what makes this opportunity so incredibly exciting. I’ve already told you this company isn’t just an ordinary pot stock. It's a drug delivery and nanotech powerhouse. Cannabidiol is just one application of its breakthrough. But it can also be applied to hundreds of other powerful compounds. Did you know that roughly 50% of all FDA-approved drugs are fat soluble like CBD? Many of them have the exact same bioavailability issues. They’re not as cheap, safe, or effective as they could be. More importantly — a further 90% of all drugs currently in Phase 1, 2, or 3 clinical trials are also fat soluble. It’s quite literally an entire generation of drugs. The patent-protected molecule of the century could work for nearly all of them. And, the company has the data to prove it. It's already tested the molecule of the century with Cyclosporin — an immunosuppressant therapy used to treat organ transplant rejection. It produced bioavailability gains of 600%. It's also applied it to Methotrexate — which is used in chemotherapy. The bioavailability improvements have been stunning. Now they’re bringing proprietary, patentable versions of both drugs to the market through an accelerated FDA approval process. Both should be in Phase 1 early this year. InSYS and GW Pharma are the two biggest players in pharmaceutical CBD. The therapies they’re developing are for Dravet and Lennox-Gastaut syndromes. These are tiny, tiny diseases with minimal commercial viability. InSYS boasts a market cap of $720 million. GW Pharma is up to $4.22 billion. The stock I’m telling you about today could be into Phase 2 with new, CBD therapies for both diastolic heart failure and glioblastoma within 2019. With FDA approval this should absolutely be a $10 billion company. At that market cap, we’re talking a 11,678% return! Frankly — it could be worth a whole lot more than that very soon. We could be looking at the next Bayer, Pfizer, or Merck. Today you can buy shares of this stock while it still has a measly $84.9 million market cap. In it you’ll find our complete analysis of the opportunity. The company’s name and future ticker symbol. Thorough company profiles... based on firsthand analysis, including information you won’t find on CNBC, in Forbes, or even in industry journals. You’ll be introduced to its scientific dream team — with world recognized experts in heart, cancer, immunology, nanomedicine and drug delivery. We’ll lay out all the key milestones to watch for over the coming weeks and months. You can count on these to drive the stock. The analyst “consensus” you won’t hear in press releases... but that we get from hobnobbing with industry insiders. And details of its assets, holdings, and upcoming dates for company reports. Ultimately we think this should be a 11,678% win. Enough to turn $5,000 into an obnoxious $588,900 windfall. We’re going to get you in on the ground floor. There is ONLY one rule. You must be a member of The Marijuana Manifesto to get in. Fortunately, I’ve made it easier than ever to give it a test drive. If you’re ready right now — all you have to do is click “Subscribe Now” under this video. When you do you’ll get your copy of “How to Earn 11,678% on the Molecule of the Century” — with all the facts on this incredible opportunity. As I mentioned at the start of this video — my name is Jimmy Mengel. I work with the Outsider Club to bring hundreds of thousands of readers the latest news and breakthroughs from the marijuana industry. Most importantly, I help readers just like you get in on the most lucrative pot opportunities. I recommended my readers get in on Canopy Growth Corporation shortly after I became the first newsletter writer to visit its facilities. This was way before anyone else was talking about the opportunity. The company was expanding its pot growing operations at lightning speed. And in just a few years, my readers could have booked a 3,375% gain. Then there’s Future Farm Technologies. In June 2017, it was just beginning to break ground on a 10-acre greenhouse in Florida that would supply the Sunshine State’s retirees with medical marijuana. By December, the stock had delivered a 428% return for my readers. 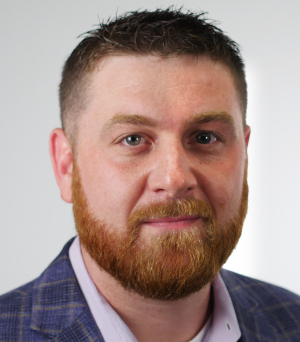 Cronos Capital Group offered my subscribers a 380% gain on the back of an announcement to build the largest indoor cannabis production facility in the world. Imagine what scoring those kinds of regular, consistent gains would do for you and your bank account. I personally know just how life changing these kinds of winners are because I regularly hear from everyday investors just like you. I was in a savings program at work for 36 years and never came remotely close to Mr. Jimmy Mengel's first tip. I doubled my money! Bless you Jimmy looking forward to a great relationship in the future. I am really happy to continue my association with Jimmy Mengel... over the last 30 years [I’ve] tried a lot of different financial newsletters and they’ve all lost me money. I started [with Jimmy] in March 2015 and now have stakes in 18 companies that show a very handsome profit! Can you imagine opening your stock portfolio and seeing no less than 18 winners? That’s the opportunity on the table for you today. Because I have a proven track record of choosing winning pot stocks time and time again. Bought in on Canadian and UK marijuana stocks about a year ago and have almost doubled my money! I can only see it getting better. In for the long haul. I made out like a bandit with one tiny marijuana stock. I got in a little late @2.12 per share which I thought was a little high but over the last few weeks I earned 400% (some made 800%) and I sold half as Jimmy suggested. I can’t believe it! My first stock in 20 years and it paid off big. Now I’m taking part of my earnings to get a Lifetime Membership! Thanks Jimmy! I can't wait to see what’s next. Thanks for the million-dollar idea Mr. Mengel. You Rock! We just [booked a 194% gain]. But, look, this is only the start of the pot fortunes on the table for early investors. The next wave will come from the biotech companies using cannabis’ medicinal compounds to cure many other serious diseases. It doesn’t matter if you missed out on any of the gains that have come before. Because today you have a rare second chance to get in the next windfall of pot profits. You’re going to get this report for FREE... but that’s not all. This sheer quantity of experience is absolutely crucial to make money in pot stocks. Without it, it’s hard to avoid the pitfalls and junk that litter the space. But with it, you can uncover and ride high-quality marijuana firms to your own personal riches. And that’s exactly why I’m opening the doors once more to The Marijuana Manifesto. It’s where I recommend pot stocks that are wound up like a coil and on the brink of exploding higher. Some have even called it an “unfair advantage” for those looking to make their fortune. At Least One Brand-New Pot Stock Poised to Take Off EVERY MONTH! I’ll leverage my rolodex of industry insiders, experience, and deep-dive research to bring you the highest-potential pot stock that could soar 5x, 10x, even 20x your money, every single month. Weekly Pot Portfolio Updates. Every week, you’ll get at least one new issue of The Marijuana Manifesto complete with a full analysis on what’s happening with the stocks you own. You’ll get my full thoughts, updates on the cannabis market, and a full breakdown of the latest news from our portfolio. Regular Pot Profit Alerts. We’re not looking to buy and hold for the next 30 years. We’re looking for rapid, outsized gains that can turn $10,000 into $30,000 or better. I’m always monitoring our portfolio and if it’s time to cut loose or take our profits, then I’ll email you with crystal-clear instructions on what to do next. Access to All of The Marijuana Manifesto Special Reports. Sometimes an opportunity is so time sensitive, I’ll create a special report for my research. You’ll receive an alert as soon as it’s in your members’ area so you can get in on the ground floor before the mainstream catches on. White-Glove Treatment from My World-Class VIP Support Desk. If you have a question about your membership or any other concerns at all, my VIP team is ready to help. It can be about anything whatsoever. All you have to do is pick up the phone or send an email and we’ll take care of you. Plus... Bonus Subscriber-Only Q&A Sessions, Transcripts of Conversations with Industry Insiders, Video Tours of Marijuana Facilities Worldwide, and Much More! 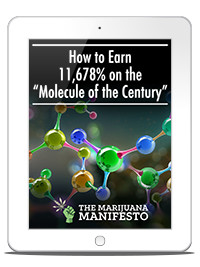 And of course, the moment you agree to take a test drive of The Marijuana Manifesto, I’ll send you “How To Earn 11,678% On The Molecule Of The Century” absolutely free. Inside you’ll find ALL the details you need to get in on this opportunity before 99% of investors. Simply put, The Marijuana Manifesto is how you can stake your claim on the explosive profits we’re going to see over the next 12 months. Imagine doing the work once, and getting paid FOREVER. That’s exactly how Qualcomm has delivered 6,984% gains to investors. You see, every year it collects $1.2 billion in royalties from companies using its tech. A group of master growers is behind a $2 stock that collects “pot royalties” by helping other producers increase the yield of their marijuana harvests. It’s ramping up its operations and taking on new customers at lightning speed. Just recently, it signed 10 brand-new clients. And it's showing no sign of stopping. Which is good news for you because if this firm locks down just 2% of the market, that could mean a $100-million-plus-per-year business. Or nearly three times its current market cap! 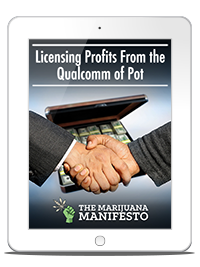 You’ll get the full details inside “Licensing Profits from the Qualcomm of Pot” when you trial run The Marijuana Manifesto today. 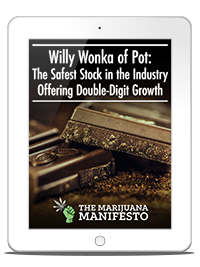 In 2008, a chocolate factory closed and laid empty for years, until one ambitious pot company took over and created the most impressive growing operation in the world. It sits at the heart of the $1.7 billion Canadian medical marijuana market, but that’s not why you need to invest TODAY. It’s because the company is aggressively entering a market 32 times bigger. You see, relaxing medical marijuana laws around the world has created a booming export market for pot. It’s worth around $55 billion annually. And the CEO of this firm has told me personally it’s his number-one priority to help supply the world with cannabis and make his investors money. The Science of Picking Explosive Pot Stocks." You’ll be taken under the hood of how I uncover the most profitable cannabis companies on the market today. You’ll have everything you need to find your own lucrative pot stocks in just 30 minutes. You’ll get an in-depth analysis of every corner of the pot market, beyond just the smokable flower. In just one short read you’ll know everything you need to start reaping riches from this exciting market. Each new state that rolls out legal marijuana provides a trigger for pot stocks to shoot higher. This calendar will keep you on top of the key dates around cannabis laws across the country. You’ll be able to access this calendar in your members’ area, where it’s updated monthly. BEFORE anybody has a chance to bid up the stock. It’s only a matter of time before its “molecule of the century” becomes mainstream news and the gains are taken off the table for everyday investors. You don’t need me to tell you that getting in on a company making a world-changing medicine can make you a fortune. The deposit I’m asking of you today is just a fraction of what it’s worth. I’m aware I could charge upward of $10,000 for this research. There’s simply no one else with my experience or contacts in the industry. And the bigwigs on Wall Street would be more than happy to pay top dollar for my work. But I’m not in this business to help New York traders buy another home in the suburbs. Which is why the team at Outsider Club and I have done everything we can to make this as affordable for the everyday investor as possible. You’ll pay just a fraction of what just one of the gains you’re set to enjoy over the this year could deliver. To see your full discount — simply click over to the order page right now. You Make Money or I Work for You for FREE ($1,999 Value)! I can tell you right now, I’ve never seen a pot stock with the potential to outgrow the sector and become a genuine biotechnology Titan. Not only is it “fixing” the broken science of medicinal cannabis — it's got the potential to deliver breakthrough treatments for both heart disease and cancer. That’s why I’m absolutely confident that this stock is set to grow as much as 11,678% starting within days of the IPO. If this stock doesn’t double within 12 months, I’ll give you a free year of The Marijuana Manifesto. Every other recommendation you’ll get from me over the this year could quadruple... but if this tiny $51 million company doesn’t AT LEAST double, then I’m going to give you another FULL YEAR of membership to The Marijuana Manifesto. That’s like getting handed a $1,999 check. And again, I’ve never done this before. Because even though no one can predict the future, I’m certain this stock will go vertical in just a matter of months. And I’ll be bringing the opportunities directly to you inside The Marijuana Manifesto. ...and most importantly, the firms that are about to rocket higher and take your money with them. Again, this is a brand-new publication you’re getting, at NO EXTRA COST, for taking out your trial run of The Marijuana Manifesto today. Sound good? Then click the "Subscribe Now" button below. Right now this situation is deep under the radar. Only a handful of institutional investors are aware of the stock. Thanks to my partner Nick Hodge, we have the inside scoop. In 2019, it will have several therapies in Phase 1 clinical trials. This time this year it’ll be in Phase 2 with both heart and cancer therapies. Any one of those drugs could make it a multibillion-dollar company. We’re looking at the next Bayer, Pfizer, or Merck. Right now the company is trading at a market cap of just $84.9 million. But... with each passing day — more and more investors are hearing this story. Before you know it, the stock will start spiking up... eliminating our opportunity. That’s why it’s so important you act today and lock in your position. If you act in time — you could turn every $10,000 into $1.16 million! My team will send it to you as soon as you join today. You’ll see other investors pay off their homes... secure their retirements... even take the kinds of worldwide trips you’ve dreamed of... While you’re no better off. So don’t waste a minute. Click "Subscribe Now" below to be taken to the secure order form page. Fill in your details, and I’ll see you on the inside. Again, you must act today. If you want to profit as much as 11,678% as this tiny firm uses the “Molecule of the Century” to cure heart disease AND one in every two cancer patients — subscribe now. As soon as you do, my team will send you everything you need.